The term sports specific training has become a popular concept within the field strength and conditioning over the past decade. The underlying premise to sports specific training is the more similar a training activity is to the movement patterns performed during competition the greater likelihood there a positive translation to performance parameters during competition (Haff & Triplett, 2016). The concept of sport specific training is based upon the specific adaptations to imposed demands (SAID principle (Haff, et al., 2016). The SAID principle states adaptation by the kinetic chain will be based upon the demands placed upon it (Baechle et al., 1996). For example, a golfer athlete training for increases in clubhead speed within the high-speed movements of the driver swing would look to incorporate modalities and exercises which recruit the same firing patterns, kinetic chain actions, and motor unit recruitment associated with the swing at a very high velocity. The basis for inclusion of sports specific training begins in the needs analysis portion of program design where the physical parameters associated with the sport are analyzed (Haff et al., 2016). A secondary step associated with the needs analysis which can fundamentally assist in this process is understanding the biomechanics of the movements associated with the athletic actions of the sport. For example, an understanding of the phases of the golf swing, overhead throwing mechanics of a pitcher, or the mechanics of sprinting for the track and field athlete can be very beneficial. During this process of analyzation, the strength and conditioning professional can select the appropriate programming to condition the athlete around the requirements of their sport of choice (Haff et al., 2016). Athlete’s competing in differing sports require the development of certain components in terms of cardiorespiratory requirements, VO2 max, levels of joint mobility, segmental stabilization, muscular strength, endurance, and power. A basic example is the differing requirements of a marathoner and offensive linemen in American football. A successful marathon runner requires the development of their cardiorespiratory fitness levels and VO2 max. Whereas an offensive lineman necessitates high levels of muscular strength, strength endurance, power, and anaerobic capacities. Two athletes, competing in two different sports, requiring differing physical components to be developed in order to have success during competition. As a result, these two athletes will have a program designed specifically for the demands of their sport. Outside of the physical demands associated with a particular sport and the physical components such as VO2 max or muscular power of a specific sport, sports specific training can also incorporate the process of exercise selection within the programming (Haff et al., 2016). For example, a collegiate volleyball player during competition performs the actions of serving, blocking, and spiking. All of these athletic actions require jumping. During the jumping action extension occurs via the ankle, knee, and hip (Baechle et al., 2016). A base requirement for triple extension, jumping, and power development is muscular strength. Many exercises can be selected which have the propensity to develop strength in the musculature of the lower extremities. Though not all the potential exercises which could be selected are executed in an upright position where extension of the hip, knee, and ankle all occur to some degree. As a result, certain lower body exercises maybe better suited to develop the lower extremities for jumping than others. For example, a barbell front squat performed in a standing position where hip and knee extension occur with a small amount of dorsiflexion and extension would most likely be a more conducive strength development exercise for the volleyball athlete than a seated leg extension performed in a sitting position with no hip extension, ankle involvement, or recruitment of the posterior chain in the action of the exercise. The principle of sport specific training underlying goal is the development of the physiological requirements of the athlete in accordance to their sport of choice. Through the need’s analysis and the SAID principle, the strengths of this principle are apparent in terms of alignment of a conditioning program in accordance to the physiological and biomechanical requirements of the sport. Research is present showing a definitive benefit of strength and conditioning programming towards performance levels in athletes (McGuigan et al., 2012). Additional research has provided evidence on the benefits of strength and conditioning programs on improving motor abilities such as agility (McGuigan et al., 2012). Finally, research has demonstrated a positive transfer of specific strength training on sport-specific skills such as kicking velocity and bat velocity in baseball (McGuigan et al., 2012). This body of evidence in addition to the underlying goals of sports specific training are the strengths of this principle. The weakness to the inclusion of this principle within programming exists in the amount of research present (McGuigan et al., 2012). For example, limited research is currently present on the transfer of strength development to motor performance in elite athletes (McGuigan et al., 2012). Secondly, some research has shown an inclusive relationship in which improvements in strength and power have not resulted in concurrent changes in a specific sport skill (McGuigan et al., 2012). Until additional research is performed on the principle of sports specific training, the variables associated with this principle, and how this principle can be influential, a weakness will be present in accordance to it. Research has substantiated strength training benefits to the athletic population (Palmer et al., 2015). The needs analysis, program design, specificity, and periodization schedule are all components to the success and impact of the conditioning program on athletic performance (McGuigan et al., 2012). The principle of sports specific training is an additional component intertwined with these aspects of a strength and conditioning program. As a stand-alone principle, sport specific training has strengths and weaknesses as researched has demonstrated. While more research is required to substantiate the relationship and remove the weaknesses from this principle, coupling this principle with the additional components incorporated in strength and conditioning, the benefits on the physiological components of the athletic population is substantial (McGuigan et al., 2012). The golf swing is characterized by a series of biomechanical actions of the kinetic chain with the goal of impacting the golf ball with the intended club face and speed (McHardy & Pollard, 2005). This movement sequence relies on the coordinated sequence of muscular actions to produce a sequenced, fluid, and repeatable movement (McHardy et al., 2005). The golf swing from is typically separate into phases. These phases are as follows: backswing, downswing, impact, and follow through (Geisler et al., 1995). Each phase of the swing has an intended movement pattern and body position for energy translation, poximal to distal sequencing of body rotation, and correct timing of the club motions into the impact position (Geisler et al., 1995). The biomechanics of the swing are measured from a mechanical and physical perspective via processes of high-speed video and motion analysis data capture systems for the purposes of creating biomechanical models of the golf swing and to provide feedback to the golfer athlete (Geisler et al., 1995). The biomechanical models of the golf swing provide insight into the physiological requirements needed to execute a proficient swing in terms of executing repeatable movement patterns in the correct sequence with appropriate speed generation. A general synopsis of the golf swing from a physiological perspective entails rotation of the pelvis with a greater rotation of the thorax to the top of the backswing (Cole et al., 2015). The increased rotation of the thorax in the back backswing with a neutral spine angle relative to the pelvic rotation creates a preload in the trunk musculature creating stored energy via elastic elements to produce more power in the downswing (Cole et al., 2015). At completion of the backswing, ground reaction forces will begin a process of energy translation through kinetic chain (McHardy et al., 2005). In addition, during the downswing an unwinding of the pelvis and thorax occur with a lateral shift of the pelvis towards the intended target. The rotation and lateral shift of the pelvis sequentially prior to the thorax unwinding maintains a stretch across the trunk to create an efficient translation of energy and additional energy generation into the impact position (Cole et al., 2015). The unwinding of the torso and translation of energy through the kinetic chain continues to occur into the impact position. Angular velocities of the professional golfer during the phases of the swing into the impact position averages are 498 degrees per second of the pelvic girdle, 723 degrees per second of the shoulder girdle, 1165 degrees per second arm speed, and 2090 degrees per second of the club respectively (Geisler et al., 1995). After impact the follow through phase of the swing occurs to decelerate the bodies rotary motions with eccentric muscle contractions (Geisler et al., 1995). A base understanding of the mechanics of the golf swing, physiological actions involved in the execution of the swing, and velocities generated by this athletic action provide insight on the physiological requirements needed for a proficient golf swing, prevent the propensity for injury, and improve performance in the golfer athlete. The kinetic chain is the physiological foundation supporting the biomechanics actions involved in the execution of a repeatable golf swing. A general synopsis of the physiological requirements required are specific levels of joint mobility, soft tissue extensibility, segmental stabilization of the lumbo-pelvic-hip complex, specified levels of muscular strength, strength endurance, and power. These components comprise the basis for a sports specific training program for the professional golfer. Outside of these base physiological components required within the kinetic chain to execute a proficient golf swing, the biomechanics associated with the swing indicate a propensity to develop these attributes in specific anatomical positions and planes of motion. Combining these two aspects create the elements of a sports specific training program for golf. The professional golfer on the PGA Tour individually determines a yearly tournament schedule. On average these players will compete in 25-35 tournaments per year beginning in January with a completion of the season at the end of September. Four major championships are included within this season and the typical PGA Tour player will compete in 3-4 events in a row and then take one to two weeks off from competitive play. The off-season of the PGA Tour player is approximately 3 months long during the months of October through December though a pre-season phase is to be included during this time as competition starts in the beginning of January. Golf is an individual sport thus concerns of space utilization in the gym or programming to accommodating large teams is a non-issue during any phase of the training year. Understanding the yearly schedule coincides with the development of a periodization schedule. The periodization schedule for the PGA Tour player will consist an off-season preparatory period of approximately eight weeks, a pre-season period where the player begins extended practice session for the season, an in-season phase during the competitive season, and a postseason period of active rest after completion of the season (Haff et al., 2016). The off-season can be broken down into mesocycles of strength endurance, strength, and power phases to prepare the golfer for the upcoming season (Haff et al., 2016). Each of these phases will develop the kinetic chain in accordance to physiological requirements of the golf swing, repetitive nature of the swing, and competitive season ahead. Exercise selection in accordance to physiological position and movement patterns are incorporated in this phase of training. 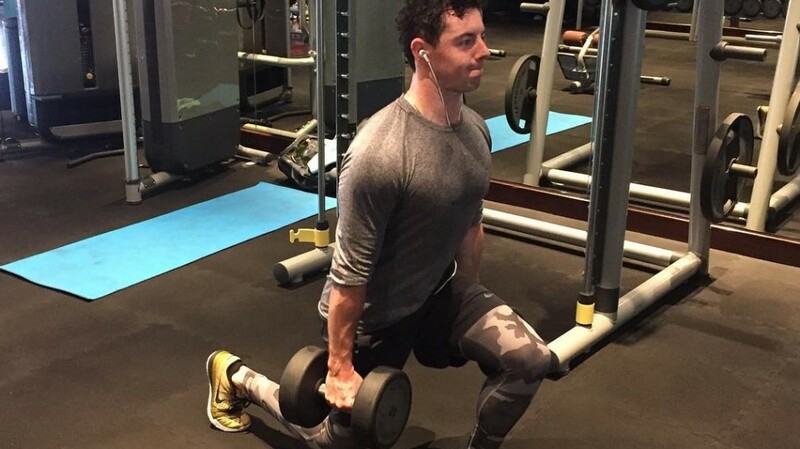 A dumbbell goblet squat developing muscular strength in an upright position requiring stabilization within the core musculature can be considered a sports specific exercise within this phase as this exercise anatomically places the body in positions corresponding to the upright position of the golf swing. A medicine ball side throw is an additional power development exercise associated with this phase of periodization schedule emulating the rotary components associated with the golf swing. Underlying the sports specific exercise and training modalities during this and every phase of the periodization schedule are the mobility, soft tissue extensibility, and lumbo-pelvic-hip complex stabilization exercises to promote the base physiological requirements needed in the execution of a biomechanically efficient golf swing. The pre-season phase will create a shift in volume and intensities to accommodate the increase in on-course practice. The in-season phase will continue this shift and be adjusted for the competitive events on a weekly basis. One aspect becoming prevalent in the in-season and introduced during pre-season in the inclusion of recovery and restoration exercises and sessions. These are to assist in the promotion of recovery and promote the body to return to pre-competition state (Haff et al., 2016). Sport specific based exercises will still be incorporated in these phases of year though volume and intensity will be modified. Due to a schedule of 3-4 competitive events followed by 1-2 weeks off does provide increases in volume and intensities during off-weeks. During these off-weeks the inclusion of more strength and power exercises can be implemented with a sports-specific component such as the exercises describe in the off-season section and for example box jumps promoting lower body power development and a component of the ground reaction forces generated at the initiation of the downswing. Baechle, T. (Ed.). (1994) Essentials of strength training and conditioning. Champaign, IL: Human Kinetics. Cole, M. Grimshaw, P. (2015) The biomechanics of the modern golf swing: implications for lower back injuries. Journal of sports medicine, 46 (3) 339-351. Geisler, P. (1995) Kinesiology of the full golf swing. Sports medicine update, 9-19. Haff, G. Triplett, T. (Ed.). (2016) Essentials of strength and conditioning 4th edition, Champaign, IL: Human Kinetics. McGuguian, M. Wright, G. Fleck, S. (2012) Strength training for athletes: does it really help sports performance? International journal of sports physiology and performance, (7) 2-5. McHardy, A. Pollard, H. (2005) Muscle activity during the golf swing. British journal of sports medicine, 39 (11) 799-804. Palmer, T. Uhl, T. Howell, D. Hewett, T. Viele, K. Mattacola, C. (2015) Sport-specific training targeting the proximal segments and throwing velocity in collegiate throwing athletes. Journal of athletic training, 50 (6) 567-577.